That is because she was tired to hear the everlasting fame sticking to her instrument that Claire Galo-Place started at the age of 15 a pure solo performer carreer to promote the virtuoso repertory of the harp. 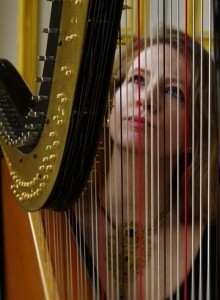 At that time, she was getting her gold medal in harp performance in the class of Annie Desmarets in the conservatory of Douai, and she was just starting a degree with Frederique Cambreling (Boulez’s Ensemble Intercontemporain) in Paris. After Paris, Claire Galo-Place entered the class of Béatrice Guillermin (Garde Républicaine Orchestra). In 2001, Claire Galo-Place won the Scholarship « Bourse Lavoisier » from the French Governement to follow her studies under the tutelage of Mrs Susan McDonald, in the prestigious Indiana University of Bloomington. Only a few months after she had gotten her Master Degree in Harp Performance, she was prize winner of the International Nippon Harp Competition (Japan). Since then, she plays in many great festivals and venues. 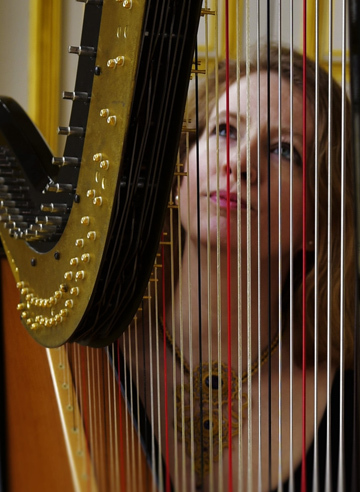 Always wanting to show the public that the harp is something else than that big stange form at the rear of the orchestra, Claire is always pushed to reveal the large palet of sound possibilities of the harp and its repertory. On one side, she likes to bring back to light forgotten composers or pieces (she founded in 2008 the Ensemble Jean Cras). On another side, Claire Galo-Place likes to work with composers to enlarge the repertory of her instrument: she premiered in 2012 Omar Yagoubi’s Toccata. She is preparing right now the world wide premier of a concerto and a solo piece from Caio Senna (Brazil) as well as a concerto and a quintet for strings and harp from Françoise Choveaux (France).